i’ve had a few good days this week that i’ve been able to get creative with. it’s been great! and not only creating, but i’ve also done housework (gasp!). this first canvas was already painted on, someone else’s work that i gessoed over in a sloppy, painterly way to create big brush strokes. i love that look and will be doing it again. the textures are great, and the colors that come from staying in the textures are so yummy! look how the colors stayed in the grooves! the second project came to me as i was cleaning out the bird cage with a toothbrush. i must have been in a zone because i was thinking of chakras and lotus flowers. 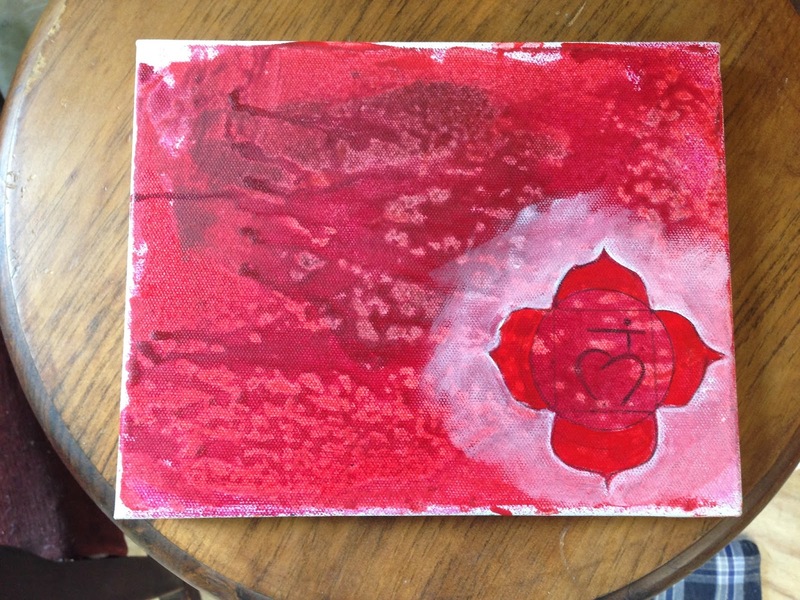 one canvas for each chakra with its color and symbol and a lotus flower to create a connectedness. i had no clue that each chakra had two symbols, one is a lotus flower with a certain number of petals. i have no knowledge about chakras, except they are energy in the body, each in a certain area of the body, and if they are blocked you have problems. and that they each have a color connected to them. that’s the limit to my knowledge on the subject. so, upon researching them and hearing that one of the symbols is actually a lotus i was thrilled that my vision was a good one. if i had thought of sunflowers and chakras it wouldnt have gone together as nicely. yesterday i spent most of the day researching, sketching , and painting these canvasses. they are small 8”x10” paintings so as to not take up a whole room with them! they are not complete at all, and the throat chakra (blue) has yet to be started. my 14 year old pup, pita, is apparently being the size reference. isn't that nice of him? i'm not feeling as good today, so will not attempt working on such detailed work. i will possibly go fling paint on another canvas, but we shall see. yesterday was a huge art day, so i won't feel so bad if i take today off.